I want to learn Go, and to do that I want to have a nice IDE that allows me to execute a build, run some tests and see what the errors are, all from within the IDE. 1) Use VIM — the following gives you some idea on how to setup VIM for Go. I didn’t follow this approach as I’m not as great with VIM as I could be, and I don’t want to have the frustrations of VIM put me off from learning Go. 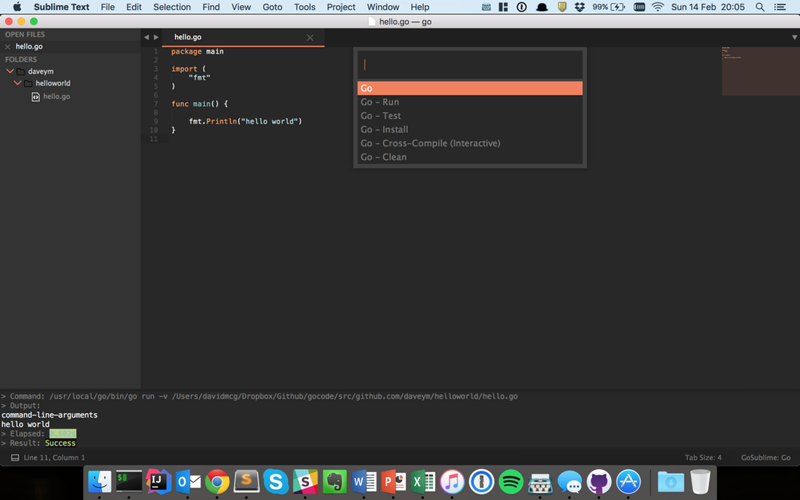 2) Use ATOM — ATOM is an IDE from Github, and go-plus provides an improved Go experience for the Atom Editor. This looks like a nice extension, but I want to execute my app as well as having the nice features that go-plus gives you, such as autocomplete, formatting, code quality checks etc. Atom & Go Plus may very well work for you, and if it does please add some tips to the comments section of this doc — sharing is good. GoSublime — Provides code completion and other IDE-like features such as syntax checking as you type, code formatting and removing unused imports. 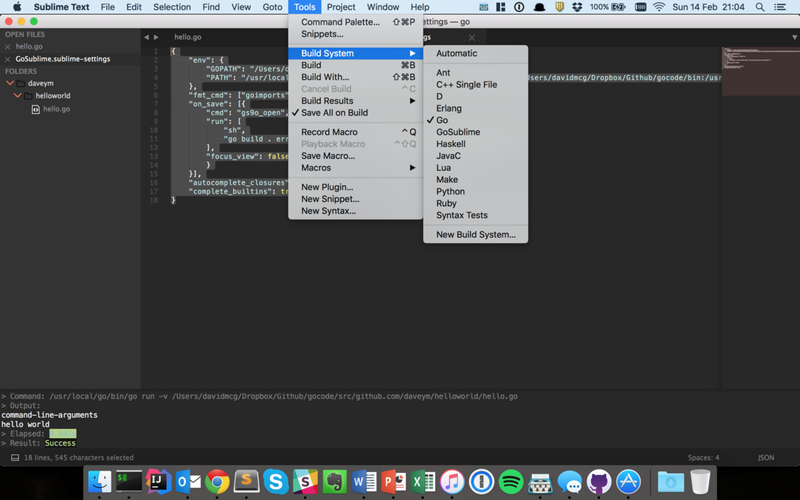 Sublime-build — The official Sublime Text package for Go build system integration. 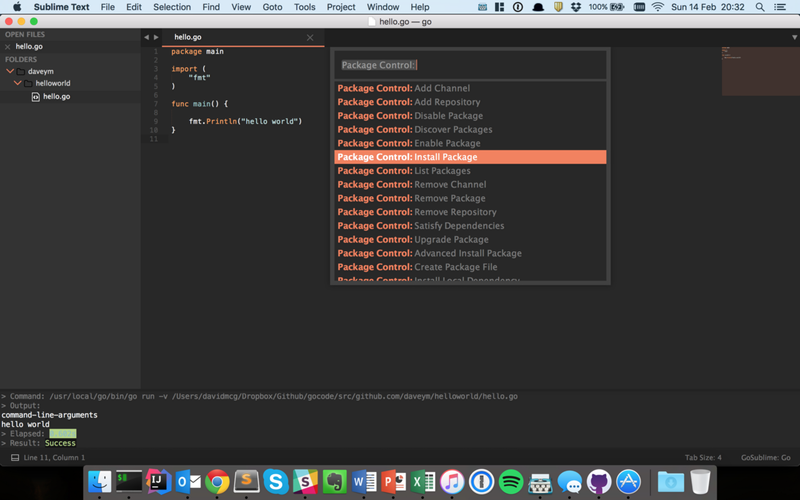 Golang Build is a Sublime Text package for compiling Go projects. 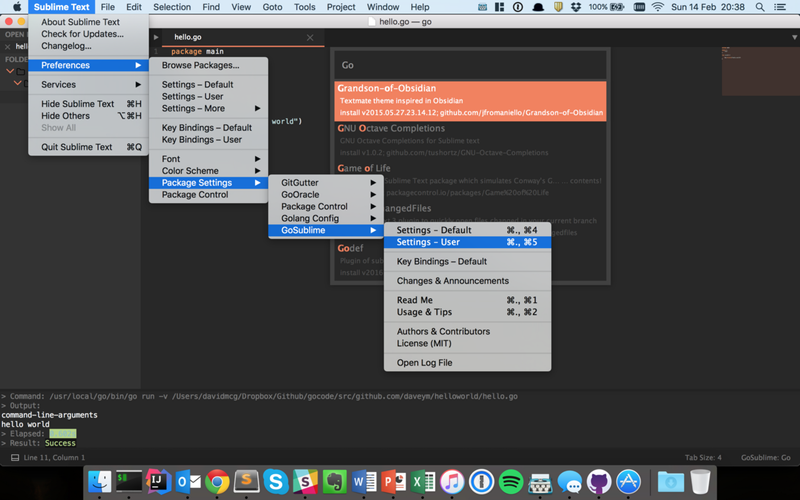 It provides integration between Sublime Text and the command line go tool. 9. To install these packages, run the following bring up the command palette and start typing Package Control: Install Package then press return or click on that option to activate it. You will be presented with a new Quick Panel with the list of available packages. Type GoSublime or sublime-build and press return to install each package individually. And once you have done that, then set the ‘Tools | Build With’ value to be ‘Go Run’ And thats you setup. ⌘ S (Save) — will run the GoSublime on save commands and format your code, check syntax and make sure the imports are correct. ⌘ B (Build) — will run your app for you, with output in the Sublime console window. Note, you can set this value to be go run, go test, go install from the Build With setting. Each time you press ⌘B, it will execute that command. One final thing — as per Jonathan Gautheron’s medium post, I have also set Sublime Text to use the excellent Predawn theme. The following providesinstructions to set this up for yourself. Please feel free to point out anything that I may have missed/could have done better. Good luck and happy learning!